Girlfriends has began airing on TV One, as of September 29. The hit show starring Tracee Ellis Ross, Golden Brooks, Persia White and Jill Marie Jones is now on TV One. The hit sitcom is airing weekdays 11am-12pm and 6-7pm along with a marathon block on Thursdays from 12-5pm. One of the series stars, Golden Brooks (Maya), is starring on the TV One original series Hollywood Divas, which has its season premiere tonight. so the network will air episodes spotlighting Maya tonight from 6-7pm. Golden also has joined the cast for the upcoming TV One original film Second Chance Christmas premiering this December. Back to Girlfriends, the move to TV One marks the end of the series airing on BET and Centric. In the series, Joan, Toni, Lynn and Maya navigate the ups and downs of life, love and friendship. Stay with us for continued updates, but as of now, no other changes to the TV One line-up besides this addition (and Living Single moving to mornings). Grimm is coming to TNT. The "we know drama" network has closed a deal with NBCUniversal Television & New Media Distribution that gives TNT exclusive off-net cable rights to the hit series. TNT plans to begin airing episodes from the first three seasons of Grimm in early 2015, with season four episodes available to join the lineup in fall 2015. Set to launch its fourth season on Oct. 24, NBC's Grimm is a drama series inspired by the classic Grimm Brother's Fairy Tales. The show centers on Portland homicide detective Nick Burkhardt (David Giuntoli, Caroline and Jackie), who discovers he's descended from an elite line of criminal profilers known as Grimms. He soon finds his responsibilities as a detective increasingly at odds with his new responsibilities as a Grimm. 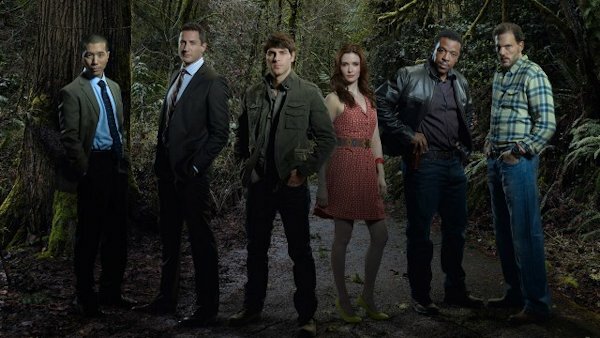 Also starring in Grimm are Russell Hornsby (Lincoln Heights) as Hank, Bitsie Tulloch (The Artist) as Juliette, Silas Weir Mitchell (My Name Is Earl) as Monroe, Sasha Roiz (Caprica) as Captain Renard, Reggie Lee (The Dark Knight Rises) as Sgt. Wu, Bree Turner (The Ugly Truth) as Rosalee and Claire Coffee (Franklin & Bash) as Adalind.